Pulitzer Prize-winning author Donald M. Murray's lively and inspiring approach to writing and revision does not condescend but invites you into the writer's studio. The ANNIVERSARY EDITION includes a new foreword by Brock Dethier, Writing Program Director at Utah State University and former University of New Hampshire colleague of the late Donald Murray. They met in 1978 and when Dethier later became an adjunct instructor at UNH, struggling to balance his teaching career with his dreams of getting published, Murray was a source of guidance and support. 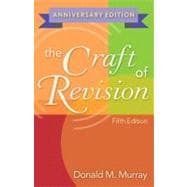 Dethier offers not only an introduction to the "man behind the book," but a retrospective of Murray's significant contributions to the Composition world and the ways in which THE CRAFT OF REVISION helps you to actually DO the writing--not just talk about it.